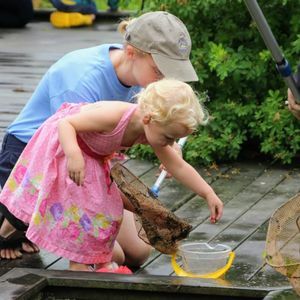 CAMP BUMBLEBEE: "Critter Time & Nursery Rhymes"
June 17–21, 2019 10–11:30 a.m. Calling our littlest nature lovers! It's time to welcome summer with songs, games, crafts, healthy snacks, and lots of outdoor fun. We'll search for wiggly caterpillars in the Funshine Garden, look for butterflies along the meadow's edge, and visit the Arboretum's goat herd. From splashing in the stream to hunting for tadpoles in the wetland, Camp Bumblebee is summer at its best. Grown-ups are asked to join their little ones throughout the camp experience.